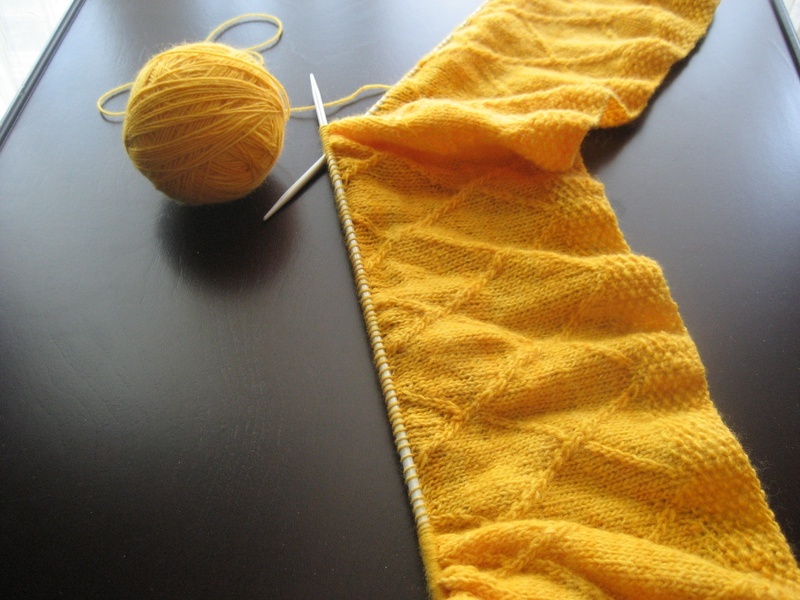 Does a new project equal new yarn for you? Of course I had to look in my somewhat consistent stash for a compatible yarn and despite a rather large stash I of course did NOT find the ideal yarn! Isn’t that just typical? So what to do? Should I go online and buy some? Or should I dive into my stock of undyed yarn and dye some myself? Well I went for the second solution and as I’m writing this I’m dyeing a merino/nylon/cashmere blend yarn in turquoise. I think turquoise is such a beautiful and happy colour and that it can be used both for girls and boys. Do you agree or do you think turquoise is definitely a “boy colour”? Once the yarn is ready I’ll show you the pictures before actually casting on for the blanket. And then there is the softies that I want to make. A few years ago, I crocheted and sold softies in a baby shop in Iceland. I used mercerised cotton for those and they were really nice I thought. But this time I was thinking of something really soft to cuddle up to so for the first softie I chose a merino/alpaca blend. This was not in my personal stash but rather in my stock of yarn for my shop. I used to sell commercial yarns and that is where this yarn came from (Rooster Almerino DK). The idea is to crochet or knit a blanket square and then sew on an animal head for a cute cuddly toy. 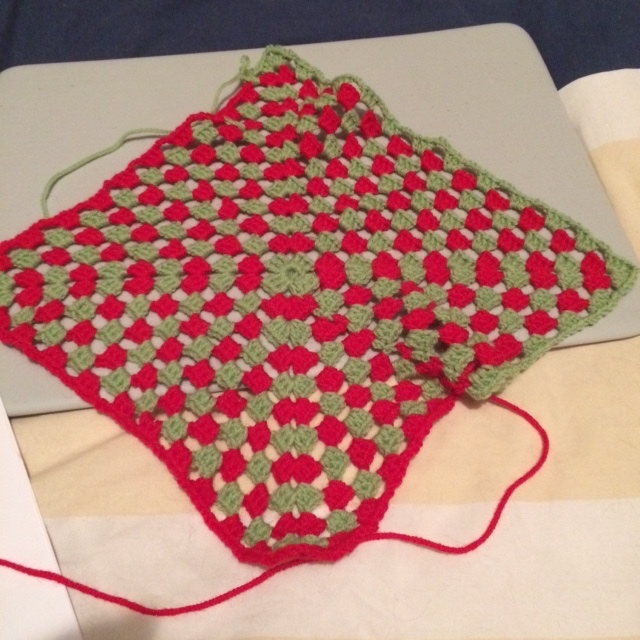 I started doing my typical crochet square – I’m not an advanced crocheter and it’s been a while since I last crocheted anything, so I’m using dc (double crochet) for the square. Then for the head, I actually bought a pattern. For the next softie, I’m planning on using the entire pattern I purchased instead of doing my own square for the base of the blanket. 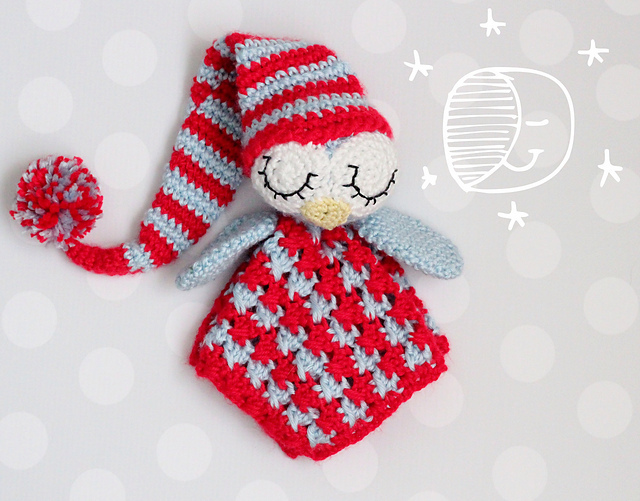 The pattern is called Sleepy the Owl and is sold on Ravelry. Here’s a picture of that Isn’t that super cute? So tell me, when you take on a new project, do you 1) invariably go online to buy new yarn because you already know that you don’t have exactly what you want in your stash? 2) Take a serious look at your stash and choose yarn that fits your pattern, maybe compromising on colours just to be able to use what you already have? I’d love to be a serious crafter, using what I have before investing in any new supplies or even better, look through my stash and THEN choose a pattern according to whatever I have in my stash and feel like using. Even though I have a large stash and access to even greater supply of undyed yarns, I still have this urge to BUY yarn just for this particular pattern. And even if that is how I function when taking on new patterns I still continue to buy yarn just because I love it, even if I don’t have any pattern in mind for that yarn. So this is sort of a vicious circle for me and I don’t see myself getting out of that pattern any day soon. Do share how you function. Do you only buy yarn when you have a particular project you want to cast on for? Do you buy yarns just because and then when you find a pattern, maybe buy even more because none of those you already have fit? Have you ever done a “yarn diet”? Did it work? Did you have a plan for that? « Baby blankets – I need to make 2! Love that owl softie! It’s adorable! Well turquoise/aqua is my all-time favorite colour so I am really rather biased! However, I think it’s a great gender neutral colour. It can be paired with hot pink for girls or greys, blacks, browns for boys. I say go for it–turquoise is the new green! As far as projects. Well ideally I try and use something from my stash…but what do you know I always end up being inspired by another yarn or fabric! Or sometimes I don’t have quite enough of what I need–go figure. “The Stash” is such a problem for crafters isn’t it? You always buy yarn/fabric/whatever medium you craft with thinking that you will use it one day or you save it for the “perfect” project and that project never appears.